For this beautiful styled studio portrait session, I worked with my daughter to plan every detail. 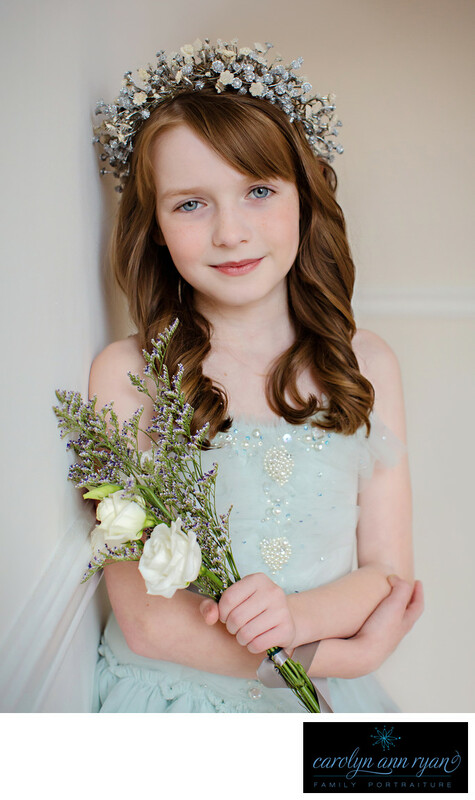 She selected the sparkiling blue fairy dress with tulle bottom along with the coordinating floral wreath from The Borrowed Boutique. I love so many of the sweet photographs we created but this is certainly my favorite. We planned this session to decorate her new bedroom in our new home and I just recently ordered the beautiful trio of canvas prints that will display on her walls from this session. I order two vertical 16x24 canvas along with one 30x24 canvas to display horizontally in the middle. We needed a longer display to fit the bigger walls in her bedroom. The first night that we moved into our new home in North Carolina from New Jersey, my daughter looked at her full size bed and said, "My bed shrunk". I laughed, as I explained that the bed didn't shirnk, but instead the room itself is much bigger with higher ceilings and longer walls, so it just gives the illusion that the bed size is smaller. But I assured her, that her bed did not shrink in the heat of the truck during the drive from NJ to NC.Keywords: blue (138), curls (48), fairy (3), floral wreath (3), flowers (6), girls (165), indoors (30), pearls (3), rose (6), roses (3), sparkles (3), studio (48), tulle (6). 1/320; f/4.0; ISO 1250; 50.0 mm.